Hawaiian Chicken is a great "dump" recipe. A dump recipe is one you pull from your freezer, dump the entire bag into the crock pot and it's ready to cook. There are many versions of this style of chicken, but hands down this recipe has just the perfect blend of lightly sweet and a touch of savory. Some of the other versions are just too sweet in my opinion. I had a baby shower coming up for a friend. I wanted to bring to her more than just a baby outfit, so I decided to make her several meals for her freezer as a part of my gift. 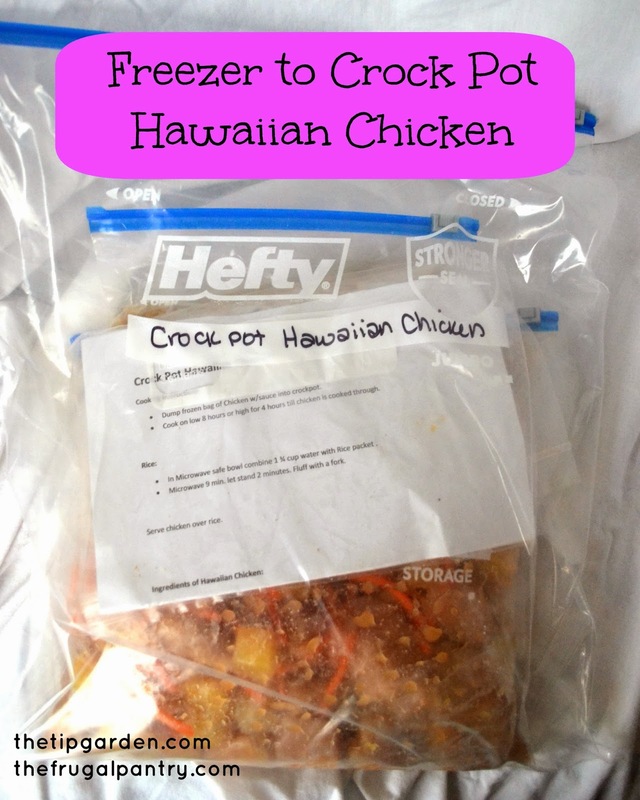 This Crock Pot Hawaiian Chicken was the first one that came to mind. It has mild ingredients for a breastfeeding mom, yet tons of flavor. Add in the ease of just dumping the meal directly into the crock pot and hitting go? Can you say perfect for a crazy tired, busy first time mother? Cut chicken into 1 inch cubes. Place chicken cubes in a one gallon sized freezer bag. add in any optional vegetables. Set aside. Pour approx. a 1/4 cup of the juice into a small bowl. Add the corn starch and whisk till well blended. Set aside. In a large mixing bowl, dump the remaining entire can (both pineapple chunks and remaining juice). Add in the chicken broth, brown sugar and soy sauce. Stir to blend till sugar is dissolved. Add in the small bowl of corn starch/juice mixture and stir until till well blended. Pour pineapple mixture into freezer bag with the chicken cubes. Squeeze as much air as possible from the bag as you seal it. Label and freeze up to 6 months. Cook on low: 10 hours if frozen 8 hours if thawed. OR, Cook on high 6 hours if frozen or 4 hours if thawed. Till chicken is cooked all the way through. Jan's Tip: For a baby shower or get well gift: I placed the one gallon bag of chicken/pineapple / sauce into a larger 2 1/2 gallon sized freezer bag. Then I poured 2 cups of instant brown rice into a quart sized freezer bag and sealed it, then tucked the rice bag inside the larger 2 gallon sized bag on top of the chicken bag. Then I typed up the cooking instructions for both the chicken (see cooking instructions above) and the rice (from the rice box). Sealed the printed instructions into it's own ziplock bag and tucked it inside the 2 gallon bag with the rest of the ingredients. Now the recipient has everything she needs to make the meal.